We’re in Montargis today, talking about Mark Renshaw; he has some nice wins in his palmares; the 2006 Tro Bro Leon, a stage in the 2008 Franco Belge and a hand in shattering Garmin’s dreams to win the TTT in the 2009 Giro. But it’s his performances over the last two days which have caused me to reappraise my opinion that Super Mario’s right hand man, Mario Scirea was the greatest lead out man ever. Yesterday, I said that Renshaw was brilliant – and I try to avoid over using those superlatives – but today’s performance left me shaking my head in wonder. The finale was super fast into Gueugnon as the GC guys – Lance, Basso, Cadel and even ‘Bert’ had the boys doing the galley slave ‘ram speed’ stuff to stay out of trouble at the front and be part of one of those nasty echelons, should they form. Columbia were there too, along with Lampre and those chunky Garmin boys – but the men in yellow in white have changed tack; not the 2009 locomotive with each carriage peeling off in a well practiced sequence, instead doing more work before the finale, – and accepting that Lampre, Cervelo and Garmin all have solid trains – then leaving Cav in the capable hands of that man Renshaw after the flame rouge to bob and weave to the right place at the right time. Fast, smooth, courageous – and perhaps most important – possessed of the coolest of heads at the highest of speeds, Renshaw express delivered his package like the master that he is. ‘Majorly impressive!’ as Sean might say. One of those precocious track talents that the Aussies seem to mass produce, he was a multiple junior track champion before moving on to the junior Worlds where he was twice in the winning team sprint squad as well as lifting the kilometre title. As a senior he was part of the wonderful ’02 Aussie squad which took the Commonwealth and World team pursuit titles. In 2003 he rode stagiaire for F des J as prelude to two seasons with Madiot’s men. Then it was three seasons as Big Thor’s henchman at Credit Agricole. Just a couple of years ago, Mark, riding for CA, was winning sprints in his own right – here, at the Tour Down Under. But it’s with Columbia and Cav that he’s found his métier: – the way he takes a relaxed glance look back to appraise the situation at 60 kph plus leaves me in awe. And Cav – a lot of that anger and frustration is about his own failings; he hates to lose, makes huge mistakes in the full view of the world’s press but then he cries with joy when he wins – his gaffs never make get me annoyed, but they do make me wince. Anyway – I’ve decided to ‘come out’ as a ‘CavFan’ – I feel better, now. 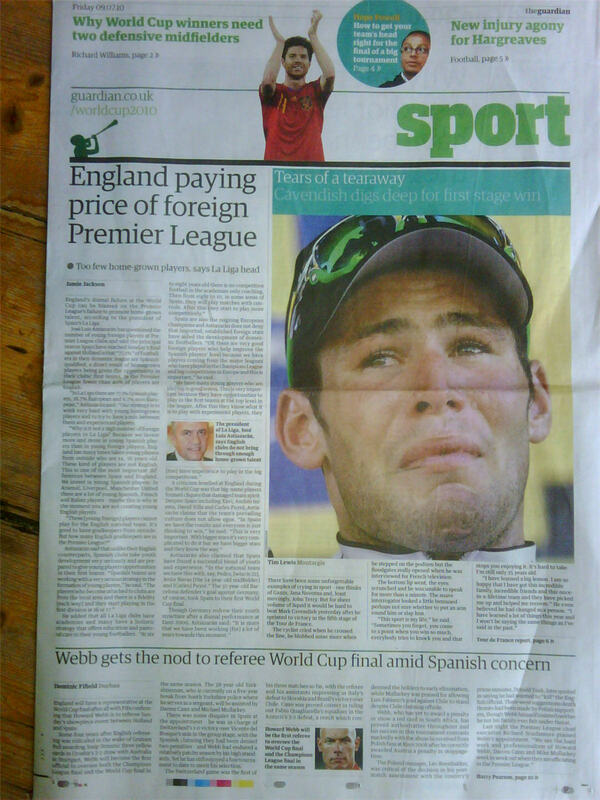 The Manxman is certainly doing a job in terms of driving the sport into the main stream consciousness; a huge picture of him dominates the front page of The Guardian’s sports section and there’s another great shot of him taking the stage on the centre pages. 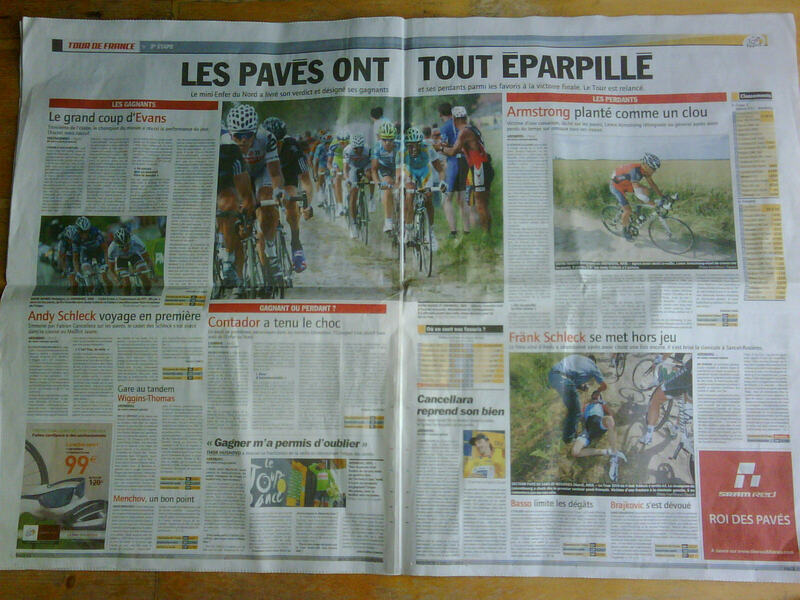 Meanwhile, over at L’Equipe we get a chance to look back at pave stage; it gets front page plus five full pages. Les Paves Ont Tout Eparpille. Those French journos are fickle though, Fabian (I’m a wee bit worried about his implying Divine intervention in his getting the jersey back, though), Thor and Andy Schleck all get 10/10; Cadel gets 9/10; Bert 7/10; Lance 5/10 but poor old Sylvain Chavanel gets 4/10 – being delayed in the Frank Schleck crash and then two bike changes cuts no ice with them L’Equipe garcons. Good use of vocabulary, I thought.